Navarra kicks off its U.S. campaign with an exclusive dinner for select trade and media at Toro NYC. ‘Run with it!’ D.O. 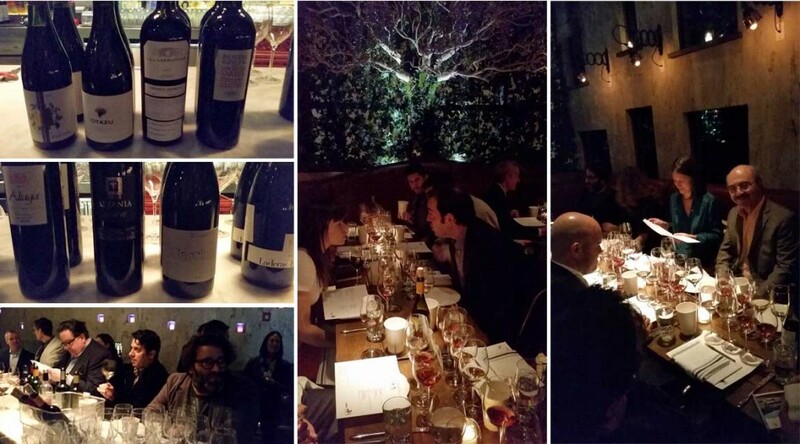 Navarra’s U.S. marketing entity, officially launched its 2014-15 promotional campaign with a wine dinner at Toro-NYC last month, hosting a small group of trade and press for an informal, seated tasting in Toro’s airy private dining room on Monday, November 10, 2014. It seems fitting that a wine region so closely linked to bullfighting’s greatest spectacle—the annual Running of the Bulls in Navarra’s regional capital, Pamplona—should launch its campaign at a restaurant called Toro. Toro-NYC is Boston/New York-based chef (and recent James Beard Foundation Award winner) Jamie Bissonnette’s take on Northern Spanish tapas (or pintxos, as they are typically referred to north of the Ebro). Four courses of savory small plates came out in quite nicely measured waves (in fact, five savory courses came out, if you’re counting the passed hors oeuvres before the sit-down portion of the evening). Eleven wineries from Spain’s D.O. Navarra were represented, each having sent two bottlings apiece, a total of 22 wines. Though arguably a bit cumbersome a number for one evening, the amplitude of options in fact proved manageable, with six wines earmarked as ‘greeting wines’ (i.e., for the canapé hour), with the remainder divided into four flights of four; in other words, for each course of two to three small plates of food, there were four types of wine to taste: Call it suggested ‘ballpark’ pairings, if you’d like. The groupings, each wine kind of similar but still stylistically varied, opened up the palette of pairing possibility. It hedged harmony bets a bit, let’s say. But even more than specific harmonies (of which there were quite a few), the salient ascribable attribute overall that came out of the tasting was, without a doubt, diversity: very much the result of the specific, intentionally versatile line-up enjoyed at the Toro tasting—but also very much a microcosm of the region in general, about which diversity, more to come, including the specifics of the night’s tasting. D.O. Navarra kicked off its U.S. campaign, Run With It!, at NYC’s highly rated Toro on November 10, 2014. Attended by wine trade and media, the evening featured 22 stellar Navarra wines, complemented by a special menu created by James Beard Award winning chef Jamie Bissonnette.